Every salon has the common challenge of finding and retaining more customers. You have other salons in the area, competing with you over price point, services, etc. Of course, promoting your salon is important, but your promotional efforts need to attract your target customers and make them want to choose your salon over the many other options available. What helps your salon gain an edge? Try these three methods to find more customers for your salon. A salon is the type of business that needs to reach local clients looking for your service. This means you need to put more effort into marketing to your location than other marketing methods used by Internet-based businesses. Make sure that when someone is looking for salons in your area, he or she will find yours. There are numerous ways to accomplish this goal. Add location-based keywords to your website and social media pages. For instance, write “hair salon in Waco, TX” rather than just “hair salon”. You can also get ads in local publications, use Facebook advertising and find other ways to reach your audience. Plus, it will help if you can add a distinguishing feature such as being an eco-friendly salon or the only salon in the area carrying a certain product line. Hosting events at your salon gives you a prime way to drum up new business while exciting current customers. This method of increasing your customer base perfectly complements the social nature of a salon. Throw parties every so often that you can promote on social media and advertising. Your events could include makeovers, product reveals and any other elements you choose. Another idea is to sponsor events. Charities and businesses are often looking for sponsors to offset the cost of their events and to raise funds. By sponsoring, you can get your brand in front of a local audience interested in the event. You’ll do even better if you sponsor an event targeted to your customer base, such as a women’s function. Providing a great experience is an effective way of increasing business through word of mouth. On top of excellent service, the atmosphere in your salon matters. By creating a rejuvenating spa-like experience in your salon, you’ll attract attention and encourage people to return. Incorporating a water feature into your design offers the relaxing sight and sounds of moving water. This is a unique feature that not every salon in the area will have. Let people know about your relaxing environment through images, videos and descriptive text within your marketing efforts. Consider adding water features to your waiting area and other spaces within the salon for visual and auditory appeal. These features will enhance the environment for patrons and staff. 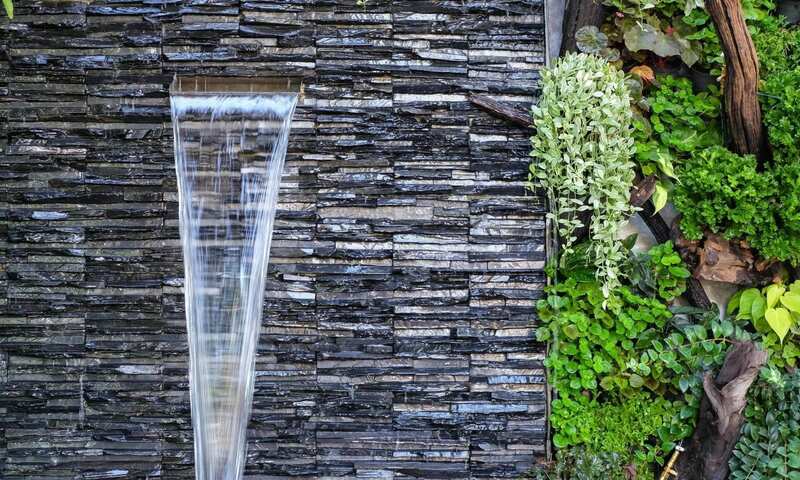 You could choose from various custom water features — including an enticing bubble wall, a soothing rain curtain or a water wall that acts as an indoor waterfall. These three methods can help you reach new customers and encourage current ones to return. By connecting with your audience, creating a spa-like atmosphere and offering fun events, you’ll become the salon everyone wants to visit. Interested in creating a custom water feature for your salon? Contact us today! Going to the doctor can be a source of anxiety for many people. However, you can create a welcoming, relaxing environment in your waiting room and other areas to help put patients at ease. A bubble wall is one type of improvement that could enhance your office — whether it’s the only change you make or you incorporate it into broader renovation or redecoration plans. Consider these reasons for adding a bubble wall to your doctor’s office. A bubble wall is a water feature that can revitalize an indoor space. Water PanelTM bubble walls are composed of custom acrylic panels that enclose soothing and visually appealing moving bubbles. Unlike water fountains and fish tanks, these water features require minimal maintenance. Also, they can be customized to your brand and design scheme through shaped glass, lighting and other elements. Bubble walls provide a piece of artwork to your doctor’s office while also offering the relaxation of moving water. The top reason to add a bubble wall to your doctor’s office is that it promotes your mission of improving health. People are calmed by water, which tends to create a meditative state within your facility. This can help ease stress, anxiety and other health concerns. Colored-LED lights can add to the mood-enhancing quality of the wall. These water features also provide an opportunity to promote your brand. Bubble walls can be designed specifically to fit your logo or other branding. For example, bubble walls can be customized with your name printed behind moving bubbles or your logo shaped into the panel. Your branding is sure to make an impression when it’s combined with the beauty and awe of dancing water — encouraging patients to return and spread the word about your business. While your patients are probably the priority for adding a bubble wall, this addition to your doctor’s office could also improve your workplace. Giving your employees a more relaxing environment in which to work could help them have less job stress and provide better patient care. Midwest Tropical specializes in creating custom water features, including bubble walls. We are experienced in designing these panels for medical facilities, among other commercial spaces, and we can personalize each one to your space and brand. Our team of designers and craftsmen will create your custom work of art at our Chicago-area manufacturing facility. You can choose from various metals and materials that our craftsmen are skilled at molding into unique pieces. You also have the choice to add LED lights and other custom features — and can pick from swirly, vertical chamber and other bubble wall options. We design, craft, test and install your water feature to high standards to ensure you have a satisfying experience and a lasting display piece for your office. When we are finished, your doctor’s office will feature a wonderful natural element that calms and beautifies the space. A bubble wall can bring the relaxing and rejuvenating feeling of the outdoors into your office through the natural element of water. This stress-relieving effect is perfect for calming apprehensive patients and promoting health benefits at your doctor’s office. Interesting in creating a custom bubble wall for your practice? Contact us today! When you’ve added a beautiful, new water feature such as a bubble wall to your indoor environment, it’s only natural to want to take proper care of it. This is especially true when you create a custom-built design with Midwest Tropical. Built to your specifications and designed with your location in mind, your water feature can be a real standout. Unlike aquariums or indoor water fountains that can require a lot of upkeep, bubble walls are pretty simple to protect. Here’s what you need to know from Midwest Tropical. Midwest Tropical has invented the first line of almost completely maintenance-free bubble walls. They are sealed and enclosed, design to prevent evaporation. These walls should be filled using only distilled water, and you won’t have to think about the water level again. By comparison, other bubble walls require you to top off the water regularly. You may also want to check the airline connections regularly to catch leaks or loosening tubes before they get too serious. If you are using distilled water, your bubble wall will only need to be cleaned about every three months. Never use any chemicals or cleaning agents, and avoid abrasive cleaners or glass cleaners, which can damage the wall. Likewise, do not use metal brushes, picks, needles or any other tools that could harm your water feature. To clean your bubble panel, wipe it with a soft, damp towel. A toothbrush works great for getting those hard-to-clean areas. Change the color of the LED lighting using the remote control. To learn more, browse our website or get in touch today! Since 1977, we’ve been the business bringing visions of indoor water features to life for our clients. Let us help you! If you have any damaged parts, you can order replacements on the Midwest Tropical website. Nothing improves the ambiance of an indoor space quite like a commercial waterfall. Install one in any retail location, medical facility, office complex or hotel to enjoy the soothing sights and sounds of nature right where you are. Commercial water features enhance your business environment and calm your clients. They set your facility apart as a place with a little more luxury. To make your business truly stand out, consider adding commercial water fountains indoors to your location. In any professional facility, atmosphere matters. To make yours more inviting, you might use any number of decorative elements: paint colors, artwork, plants, sculptures, etc. Yet while a lot of those traditional features can look and feel generic, a custom waterfall is made to be eye-catching and unique. More than that, it’s a powerful way to make a business environment more relaxing and impressive. Make your waiting room a place where guests don’t mind spending time. Soothe patients’ nerves before treating them. With an indoor fountain, your business becomes a more enjoyable location, not to mention one that stands out to visitors. Choose from water walls, bubble walls and rain curtains, customizing a design to suit your location and its style. Logos: Reinforce your business branding by putting it on your water feature. This is a great way to make the fountain unique to your business. Lights: Illuminate the cascading water in your fountain with LED lights. This can turn your fountain into a memorable display of dazzling movement. Freestanding or wall-mounted styles: Choose from either sealed and enclosed systems that require no maintenance or wall-mounted, frameless features — depending on the look you like. At Midwest Tropical, each design is fabricated in our state-of-the-art facility. We carefully test our water features to make sure the components, from pumps to acoustics, work properly. Do you want to make your office, hotel, restaurant, spa, lobby, waiting area or other space a little more inviting? Would you like to enhance your business branding with a feature that’s also stress-relieving for guests? If so, consider a commercial waterfall. Contact Midwest Tropical today to begin designing one that’s perfect for your location! 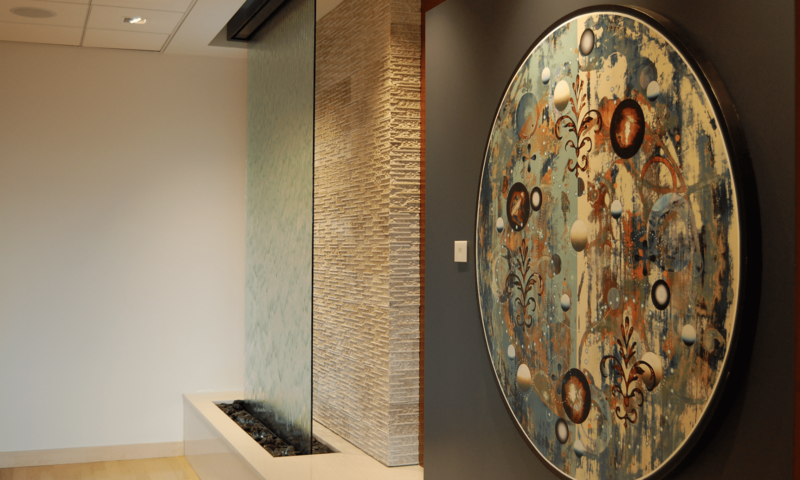 Whether it’s set in a hotel lobby, an office complex, a spa or a restaurant, a wall-mounted water feature can add wonderful tranquility and ambiance. It can also fall short. What makes the difference? Simply put, it’s how you incorporate your water wall design into the rest of your space. Add a water feature without much thought, and you risk creating a clunky, disjointed impression. Choose to be intentional about how you work the water wall into your overall decorating, however, and you can maximize its appeal. Hide any electrical cords. 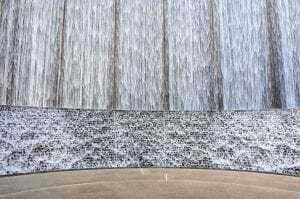 Part of the appeal of a water wall design is how it mimics the look of cascading water found in nature, despite being inside an office or lobby setting. To continue the illusion and enhance your water wall’s appeal, find ways to hide the cord(s) from sight. How? One option is to install an outlet behind the water wall. Another route is to try cable covers to camouflage the look of cords coming from the piece. You could also strategically arrange other design elements, from chairs to artwork, to conceal the cords. In any case, don’t ignore this seemingly small aesthetic issue; it can make a big difference. Use complementary decorating. Keep in mind that a water wall is a feature piece, something to which you want to call attention and celebrate. 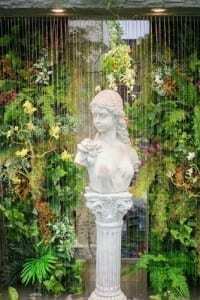 With that in mind, there are several water wall ideas to help you enhance the fountain. Chief among them is complementary decorating. Use your water wall as inspiration for Zen-like design, for example, bringing in fresh plants and soothing natural colors. Choose furniture pieces that mimic your water wall’s modern look and clean lines. By viewing your water wall as a key part of your decorating scheme, you can better use it to create a cohesive feel for your space. Be intentional about color selection for the fountain. One of the coolest parts of an indoor water wall is its ability to light the waters with your choice of colors. 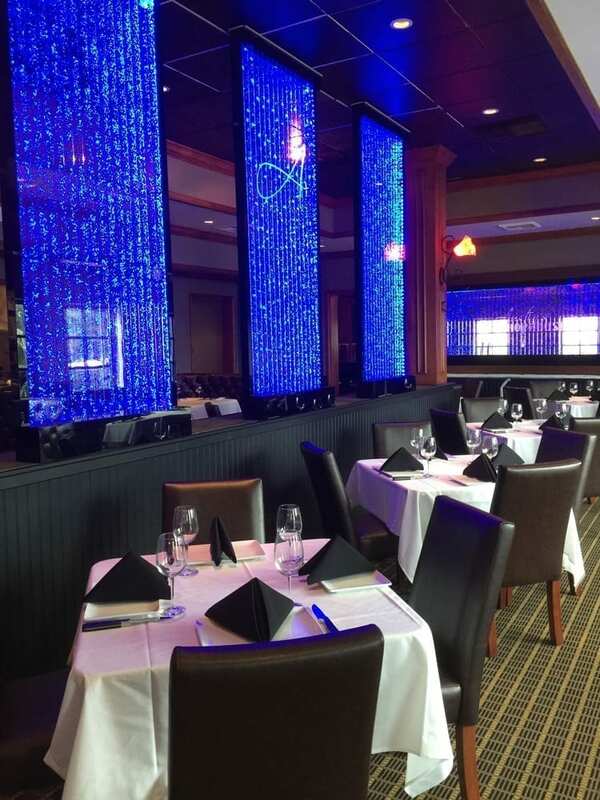 Through built-in LED lighting, it can illuminate its flowing waters in hues that match the color scheme of your business. To make sure your lighting provides maximum value, choose colors that fit your environment. If you have a lot of purple and blue in your lobby, use those hues. If your design is more muted with browns and greens, work earth tones into your feature. It doesn’t matter if you’re talking about a medical waiting room or an office complex’s atrium, water walls can be fantastic assets! 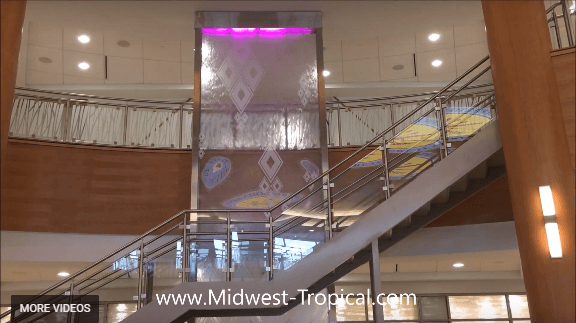 If you’re interested in learning more about our custom water walls and how they can complement the aesthetics of your commercial location, get in touch with Midwest Tropical today! There’s nothing like the gentle sound of rain to relax the mind and body — and a rain wall fountain gives you just that, set comfortably indoors! 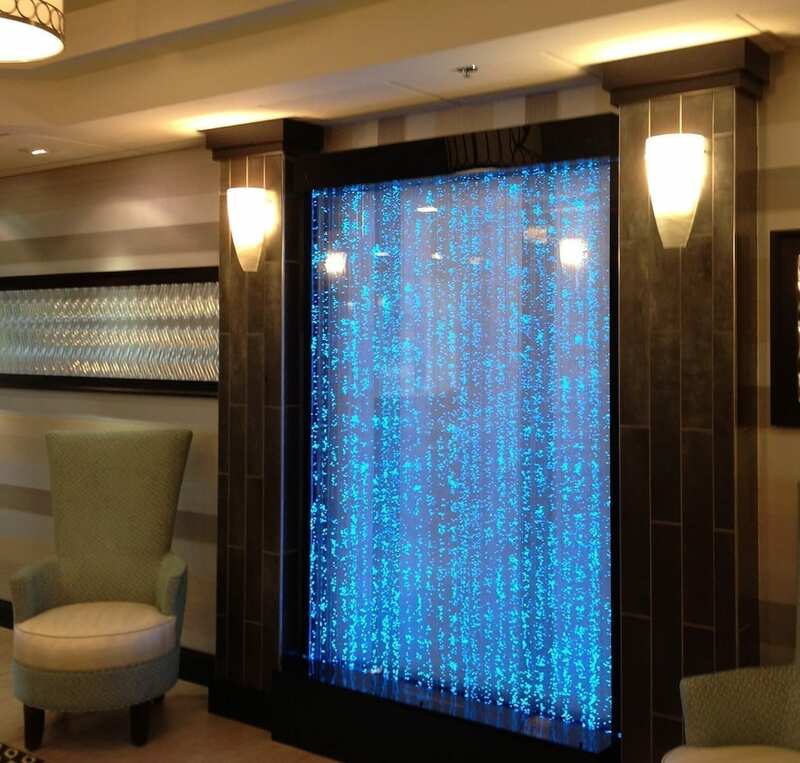 Add a water curtain fountain to your lobby to make it more tranquil or your medical waiting room to ease patients’ fears. Use one in your corporate location to enhance clients’ confidence as they decide whether or not to work with you. With a custom rain curtain design, it’s easier than ever to showcase the appeal of nature in your office. Calming atmosphere: Add the sounds of nature to your office environment, and you could instantly make your clients feel more at home. Flowing water has long been used to create a soothing experience for individuals. From a waiting room to a dentist’s chair, any place will benefit from this addition. Enhanced aesthetics: When it comes to commercial locations, beauty is about more than mere eye candy. Why? The better your office looks, the more comfortable it makes employees and clients. The more comfortable people are, the likelier they are to do business with you. An attractive location serves as a good setting to build trust and encourage new partnerships. Visual drama: Adding an indoor water feature such as a rain curtain design is a great way to create appeal and drama. A rain curtain offers unique, eye-catching visuals alongside its pleasing sounds. Minimal space requirements: Particularly in commercial locations where space can be at a premium, a rain curtain is the perfect way to incorporate a water feature. While these additions can be as tall as your room, they still have a small footprint requiring minimal square footage. 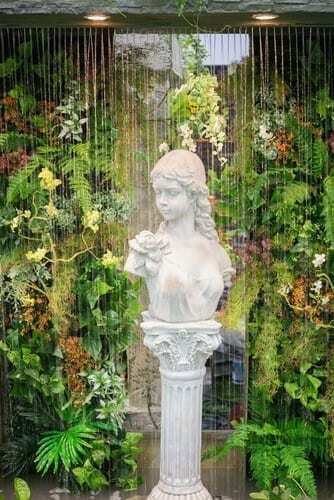 An indoor version of outdoor beauty: Take all your favorite parts of nature and bring them inside where you can enjoy them with a water curtain fountain. One of the biggest standouts of this feature is how it showcases natural beauty indoors. Adding a rain curtain is like creating a custom waterfall that doesn’t splash or damage your environment. Custom-made design: At Midwest Tropical, we custom-make every water feature. Come to us to create just the right rain curtain for your corporate setting. Whether you want a curved, standalone design or a wall of falling water, we are here to bring your ideas to life. Are you interested in adding the appeal of a custom rain curtain to your business? Learn more about Midwest Tropical’s rain curtains and talk to us today about the possibilities! Our team will be glad to build your rain curtain in-house — tailoring a unique water solution to your facility. 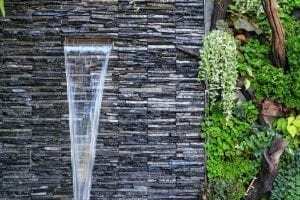 To reap the most benefits from an indoor waterfall, you need to pick the right location for it. It should be prominent enough to affect the overall atmosphere. At the same time, you don’t want it to detract from your decorating scheme, but rather to accent it. Some placements that work well include using one as a dividing wall to set apart a seating area or mounting one high to draw attention to the openness of a space. You can use an indoor waterfall fountain as a focal point like you might do with a fireplace, or you can mount it in the background of a reception area or office. To get inspired with possibilities, visit our Gallery page. Part of the appeal of a water wall is how many possibilities it provides. Take your pick of freestanding, wall-mounted or frameless designs, for example. Go with a fountain that’s fully enclosed or pick one that’s open — depending on what you like. Water walls can be made of various materials, and there are lots of design options to allow you to create the right look for your facility. At Midwest Tropical, our craftsmen are skilled at working with stainless steel, copper and other metals. We can also use acrylic, glass, tile, stone and other natural materials to build custom water walls. We can even add LED lighting to showcase the cascading water in your design. Another important factor in the quality of water walls is the manufacturer. The last thing you want is to install a water fountain that leaks, cracks or looks subpar. This would create the exact opposite of your intended goal and only make your space more chaotic! How do you know which company to trust? Start by looking for a reputable brand with experience in the industry. Midwest Tropical, for example, has not only been in business since 1977, but we also are the company that pioneered indoor water walls. We craft all our products in-house from our state-of-the-art manufacturing facility in the Chicago area. Likewise, we test all our water features thoroughly to make sure every component from the pump to the acoustics is working well. If you are in the market for a water feature that will make your facility more relaxing for guests, come to Midwest Tropical. Learn more about our water walls online, and get in touch with us anytime to talk about designing yours! Any business that’s looking for an eye-catching water feature to enhance and create ambiance in its facilities will benefit from a water wall fountain. With an indoor water wall, you gain all the tranquility of a peaceful water fountain, but with none of the upkeep of a typical water feature. Water walls are simple to install, easy to maintain and work beautifully in offices, reception areas, atriums, lobbies, etc. Curious to learn more about water wall features and why they’re so popular today? Here’s a look at what you need to know. What Is a Water Wall? 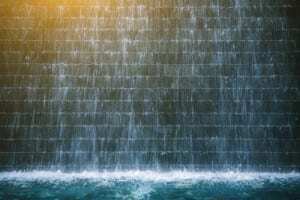 If you’re not already familiar with water walls, here’s the basic idea: An enclosed and sometimes embellished wall contains water jets that shoot water downward, creating the feel of a fountain. 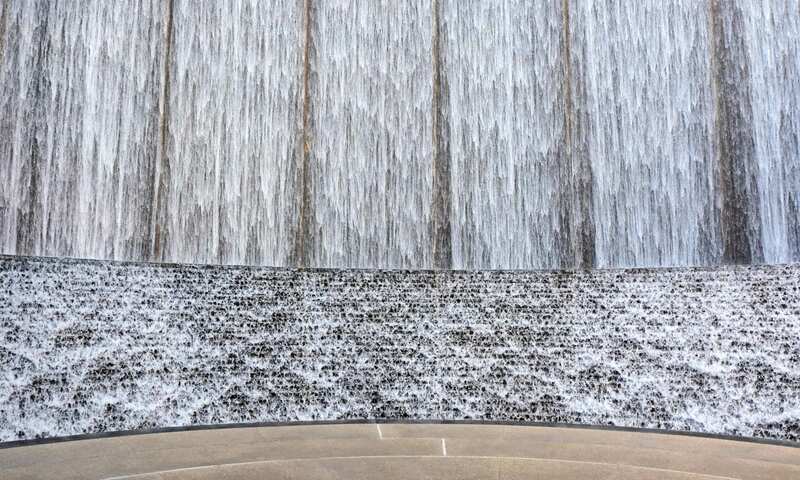 In a water wall, the water falls artistically, straight onto rocks or a wading pool. Water walls are quiet, peaceful and even therapeutic — offering a relaxing sight with the natural tranquility of flowing water. Whether they’re placed in hotel lobbies or medical waiting areas, water walls instantly calm and add ambiance to their environments. 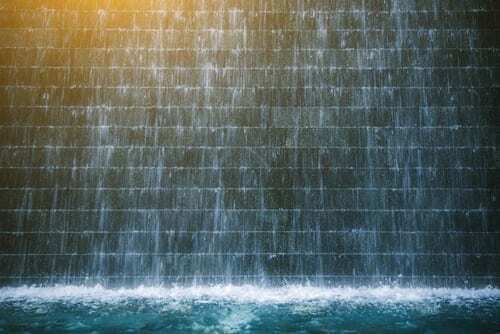 Because they offer myriad advantages, it’s no wonder water walls are so popular today, appearing in everything from office complexes to tourism destinations. Essentially, any environment in which you serve customers, greet guests or otherwise want to put people at ease can benefit from the beauty and serenity of a water wall design. Plus, today’s designs can be branded or otherwise customized to your facility, letting you feature your business name or message directly on the wall. Since our founding in 1977, Midwest Tropical has been a family-owned business committed to delivering quality products — and we only keep evolving. We have a full team of craftsmen and designers who are skilled at working with stainless steel, copper, other metals, acrylic, glass, stone, tile and more. We build water walls to fit our clients’ needs, typically including LED lighting, whether you go with a sealed and enclosed system or an open design. Go ahead and think big, too — we will custom build a water wall of any size. If you have a multi-story lobby or atrium, for instance, we’ll just scale up and add that much more beauty. We’d also love to work with you on the creative custom design that you have in mind. When you’re looking to complete the look of your facility, come to us! Clients today choose us for the kind of innovative, beautiful products that make their facilities stand out. Are you interested in adding a water wall to your facility, or curious about the possibilities we offer at Midwest Tropical? Visit our Water Walls page today to learn more. Then, talk to us about customizing a water wall to your business! Who doesn’t deal with stress today? In a world that’s increasingly demanding and pressure-filled, more people are overwhelmed, overworked and facing the consequences. This is a serious matter. Why? The fact is, stress wreaks havoc on the body — tensing muscles, triggering headaches, lowering immunity and even increasing risk factors for various diseases. That’s why any way you can counteract stress is worthwhile — including with a bubble wall fountain in your business environment. When you add a bubble wall to your office, health center, spa, hotel, restaurant or other location, you gain a feature that calms employees and creates ambiance for customers. How do bubble walls reduce stress? Here’s a look. 1. Soothing sounds. Listening to soft, repetitive sounds such as flowing water can be wonderfully relaxing — so is it any wonder people equate waterfalls and water features with stress relief? What’s more, with its flowing water, a bubble wall naturally provides white noise in your environment, covering stressful sounds and creating a more peaceful backdrop for doing work and serving clients. Use one to drown out the stress of nearby traffic, barking pets, neighbors, etc. — all with the simple, soft sound of flowing water. 2. Calming movements. The defining feature of a bubble wall is its bubbles — floating peacefully and rhythmically in its panels. As employees and clients gaze at the movement, it’s easy to get lost in the sight, distracted from worries and mesmerized into a calmer state. Because repetitive, calming movements can be so beneficial for a more meditative frame of mind, a bubble wall fountain empowers people to take a step toward a clearer, calmer attitude. 3. Relaxing colors. Set your bubble wall to a soothing green or blue hue to enjoy maximum calming power from the feature, as these colors are known for their peaceful, mood-enhancing potential. Because bubble walls are often adaptable to your environment, you can pick the color with the most stress-busting power, whatever works for you. 4. Adjustable lights. Whether you want your room brighter or darker, the adjustability of a bubble wall’s LED lighting makes it easy. Dim the room for a calming night-time effect, or brighten a space for a happier, sunnier feel. 5. A nod to an ocean getaway. Think of a bubble wall as the next best thing to a restful beach vacation. With a bubble wall, in lieu of a traditional oceanfront view, you get the serenity of ocean waters in your everyday life. Whether you run a shopping mall, an office complex, a tourist attraction or a trendy restaurant, when you want to create a tranquil atmosphere, consider the benefits of a bubble wall fountain. To learn more about the stress-reducing potential of these water features, check out the Water Panel™ bubble walls available at Midwest Tropical. Order yours today. Or, get in touch to discuss the possibilities for your site! Take the tranquility of a water fountain, but enclose it and make it easier to maintain, and you’ve got the dazzling appeal of a bubble wall panel. What’s great about an LED bubble wall is its calming, entertaining ambiance. Add one to an office space or hotel lobby to create an eye-catching focal point as well as a mesmerizing work of art. Have you seen a bubble wall fountain on display? Can you picture one in your home, restaurant or retail store? Would you like to learn more about how one might benefit your location? To help answer these questions and empower you with everything you need to know about bubble walls and how they work, here’s a look at some of the basics of these captivating water features. Available in various sizes and designs, bubble walls are self-contained, enclosed water features that can be placed in homes or businesses. Designed to be focal points wherever they’re placed, they showcase dancing bubbles inside their walls, creating ever-changing and moving artwork. 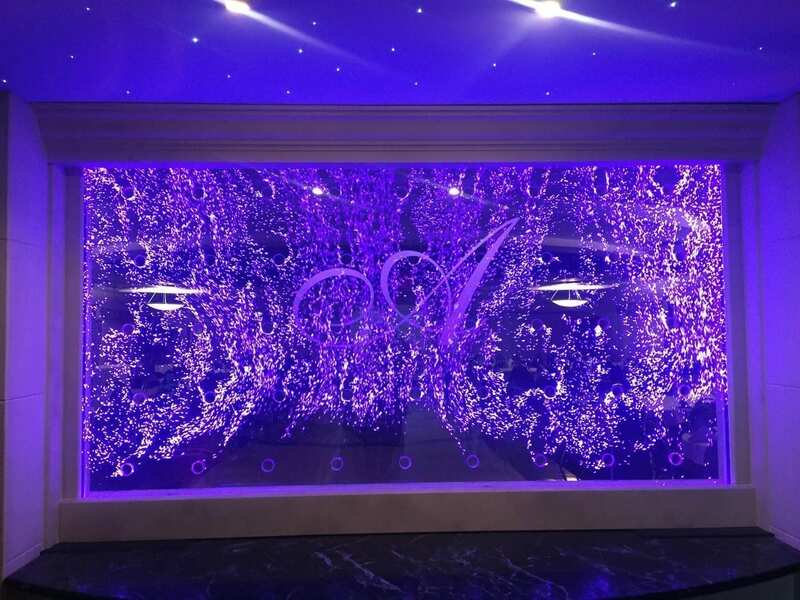 Because bubble walls can be custom-created to meet the desires of their owners, they can include various features — such as LED lighting, custom logos, shaped glass, and curved or serpentine structures. How Do Bubble Walls Work? Creating the soothing, rhythmic movement in a bubble wall is a simple concept. Essentially, in a bubble wall panel, a small, powerful motor pumps air through to the wall and distributes it across the wall’s surface. This results in bubbles. When LED lights are added, they light up the bubbles and create a specific mood and ambiance for the room. What Are the Biggest Benefits of Adding a Bubble Wall to a Commercial Space? How Much Maintenance Do Bubble Walls Require? One of the best features of a bubble wall is that it requires no undue maintenance — even less than a water wall, and with no splashy messes to clean up. In fact, with our line of proprietary, enclosed, sealed bubble walls, you have almost no maintenance with the closed-loop air-pump system and reduced evaporation. You don’t have to regularly clean it or care for it beyond changing the water every two to three months. Yet, in exchange for this little effort, you get a soothing, interesting conversation piece that breathes life into your facility. Are you curious about bubble walls? Can you picture one in your office, lobby, business or home? If you’re interested in learning more about bubble walls and how you can add one to your space, Midwest Tropical is here to help. Backed by more than three decades in the industry, we manufacture all our bubble walls in-house, using our talented design team to create custom pieces our clients love. On top of that, we install our American-made products throughout the United States and world. Browse our catalog online, or get in touch with us today to get started! Businesses understand that anything that sets them apart from their competitors is a welcome addition — and water fountains or other types of indoor water features certainly fit the bill. Commercial water features can do more than impress customers and clients — they can help strengthen your business’s brand, improve staff morale and create a more comfortable environment for everyone. Adding a water fountain or another type of water feature to your business can be a great way to set your business apart from the rest of the competition. Though because there are so many options available when it comes to indoor water features, it can be difficult to know where to begin. With that in mind, here are some tips to help you when choosing commercial fountains or water features for your business. A fountain can make a great addition to your office or store. However, you want to make sure it fits into your company’s brand identity and helps customers make the right associations with it. Fortunately, there are a wide variety of materials and styles for commercial fountains — making it possible to find something that can fit virtually any type of commercial space. For example, a garden center or spa may want to choose materials such as copper or slate that can create an earthy vibe. An upscale hair salon or doctor’s office, on the other hand, may choose glass or acrylic for a sleek, modern feel. If your business has a large lobby where clients and customers congregate, you may have room to install a large fountain with a reflecting pool to enhance the space. Although not every business has the available space for such a water feature, that doesn’t mean they have to forego adding a water feature. There are many styles of wall fountains that take practically no floor space but still bring the benefits of a water feature to an office or other type of commercial location. 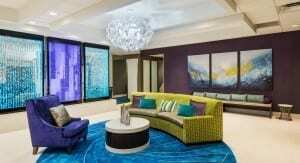 Of course, one of the primary benefits of adding an indoor water feature to a commercial space is aesthetic. The beauty of a water fountain makes a great addition to almost any space, but it can do so much more for your business. For example, the soothing sounds of a fountain can be a calming influence for a dentist’s office, where patients are likely to need a little relaxation. In lawyers’ or doctors’ offices where discretion often is essential, a water wall fountain can serve as a privacy wall that can protect clients’ and patients’ sensitive information by blocking the view and covering any sounds from a room. Water fountains also make a unique and attractive way to divide the space in an office, helping employees feel more comfortable and relaxed while they work. Adding a water feature to your business can be a powerful differentiator for a number of reasons. Yet thinking ahead and choosing the right water feature can ensure that you get the most out of yours. Consider these tips when selecting a commercial water fountain, and you’ll be sure you have what you need to set your business apart from the rest. When you want to enhance an indoor environment with more beauty, fresher air and an overarching sense of tranquility, you can’t go wrong with a bubble column fountain. Perfect in a wide range of environments, bubble walls lend modern calm to businesses, homes, stores, hotels, medical facilities and more. On top of that, they don’t require regular maintenance. 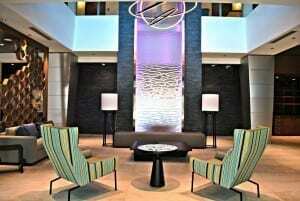 Whether you’re looking to enhance an office or a hotel lobby, a bubble wall may be just the answer you need. Enhanced aesthetics. A bubble fountain adds beauty and visual appeal anywhere it is placed. Add one to a lobby, office, room, patio to enhance that space’s ambiance and decor. A bubble wall water fountain also offers a natural centerpiece for an entryway, drawing attention and creating visual interest in the space. A soothing effect. Thanks to the sounds of trickling water, a fountain tends to have a soothing effect on its environment. Add one to a space where you want stress relief, enhanced peace and a feature that lends tranquility to the atmosphere. Natural humidity. Because they’re adding moisture to the air, bubble fountains act as natural humidifiers — improving skin dryness, sore throats and more. Especially indoors in the winter months, this can be a wonderful asset for a space. Cleaner air. A bubble column fountain produces negative ions that work to remove irritants from the air. Think of your bubble fountain as a decorative air filter that you don’t have to hide when guests visit. Not only is it attractive and soothing, but it also improves your air quality day to day. Light white noise. Looking for a way to drown out annoying sounds in your area or community? A little white noise can be just the answer. A bubble wall water fountain naturally covers some noise with the gentle sound of flowing water. Instead of hearing the loud train or the heavy traffic, you listen to the peaceful sound of trickling water. 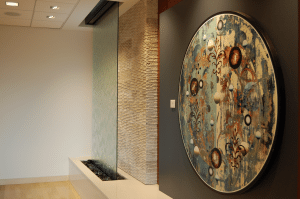 At Midwest Tropical, we offer custom Water Panel™ bubble walls that create ever-moving, visually interesting artwork that’s perfect for all kinds of settings. Dress up your space and make it more inviting with a custom-made, fully enclosed wall panel system of bubbling water. As the bubbles dance and flow within the frame, they’ll add life to your space without requiring any regular upkeep. Backed by more than 40 years in the industry, Midwest Tropical is pleased to provide a variety of custom-designed, custom-built bubble walls catered to our customers. We make all our products in-house at our Chicago-area design facility. We also professionally install our products throughout the United States. Bubble walls are just one of the custom water features we offer at Midwest Tropical. To learn more about these and other products we create, shop our website or contact us today!